President Franklin D. Roosevelt established the Civilian Conservation Corps (CCC) in 1933, and over the next eight years members worked feverishly on a variety of construction projects on public lands across America. Today the legacy of this long disbanded workforce lives on in places like Florida’s Myakka River State Park (www.floridastateparks.org/park/Myakka-River), where five CCC cabins were built between 1934 and 1941. 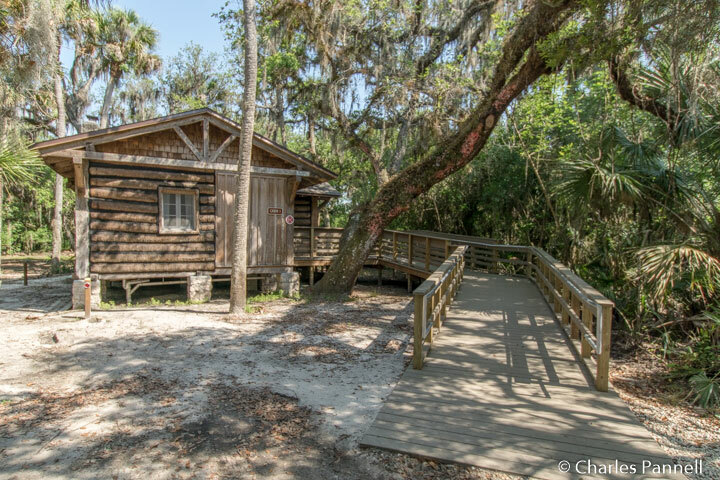 And although wheelchair access wasn’t even on the radar back then, today — thanks to some recent renovations — Florida’s largest state park now boasts a historic CCC cabin that’s accessible to everyone. Located just outside of Sarasota proper, Myakka River State Park is known as the place where the river and prairie meets the sky. It’s a beautiful spot to spend a day or two; and the good news is, the improved access begins at the park entrance. Accessible parking is available at the Visitor Center, which is just a short level roll away from the ranger station. Inside the ranger station there’s barrier-free access and a lowered check-in counter, so wheelchair-users can register and pick up their cabin keys. The CCC cabins are located a short drive from the ranger station, near the south park entrance, but off the main park road. 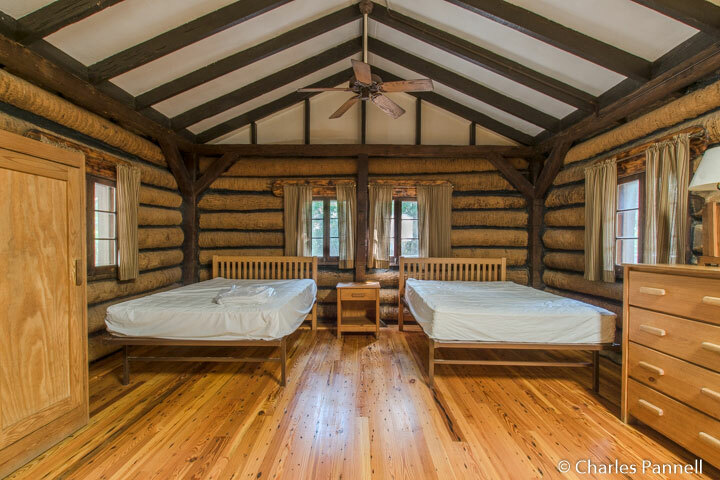 Crafted from cabbage palm logs chinked together with tar and sawdust, the cabins are surrounded by a pine and palm forest, which not only gives visitors an added layer of privacy, but also offers up some prime wildlife viewing opportunities. There’s plenty of room to park an accessible van in the large level area in front of Cabin 1, with level access over to a new ramp which leads up to the front door of the raised cabin. Inside there’s barrier-free access throughout the cabin, as well as hardwood flooring that makes for easy rolling. 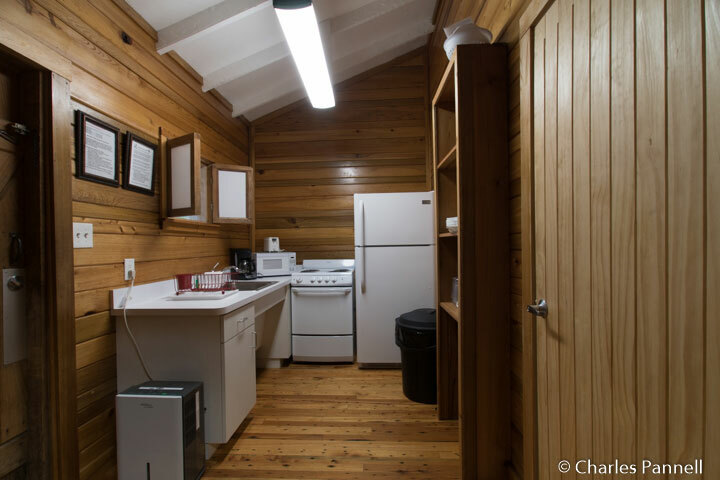 The compact kitchen includes a microwave, stove, coffee maker, toaster and a full size refrigerator; and is outfitted with a full compliment of dishes, utensils and cookware. The adjacent great room is furnished with a dining table and six chairs, a 14-inch high futon, two 26-inch high open-framed double beds with an access aisle between them, a bedside table, a wardrobe and a chest of drawers. 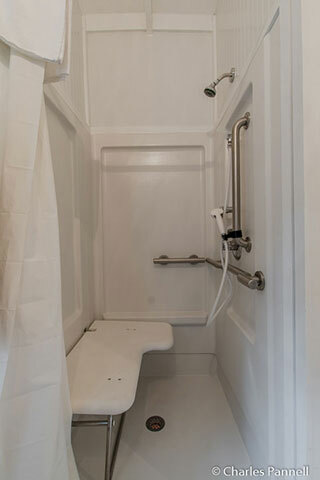 The spacious bathroom includes a full five-foot turning radius, and is equipped with a 36-inch square roll-in shower with grab bars, a hand-held showerhead and a fold-down shower bench. 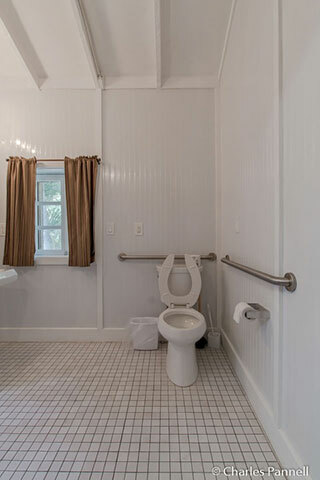 The toilet grab bars are located on the left and back walls (as seated), and the bathroom also includes a roll-under sink. 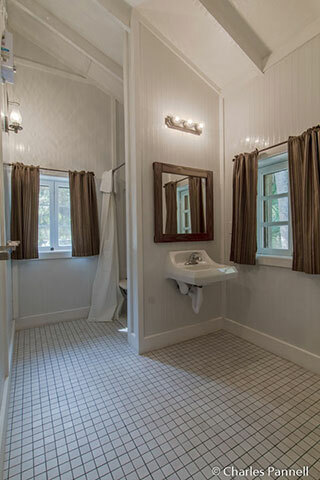 And although the cabin is rustic, creature comforts such as a small air conditioner and heater have been added. 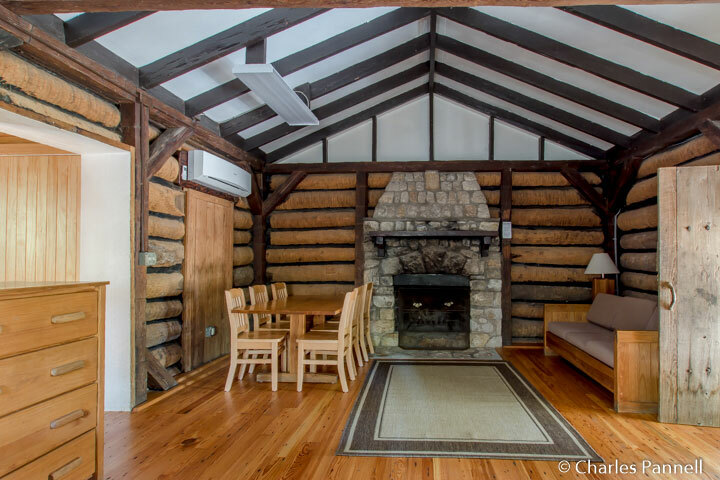 Top it off with the original stone fireplace and you have everything you need to keep you warm and toasty. Out back there’s an accessible picnic table and a grill, and although there are three steps down from the back porch, the picnic area is accessible from the front ramp. The cabin also features a nice back deck that borders the woods, so make sure to pack along some lawn chairs so you can fully enjoy it. The spacious cabin sleeps six and it’s a great option for a family getaway. It’s also a bargain, at just $70 per night. Reservations can be made up to 11 months in advance at www.ReserveAmerica.com or (800) 326-3521. Plan ahead to avoid disappointment though, as space fills up quickly, especially during holidays and on weekends.